﻿ One Sailing Day - Sail In Ionio, Sailing in Lefkada. Best prices in Lefkada island.Sail In Ionio, Sailing in Lefkada. Best prices in Lefkada island. A sailing day on our yachts, starts in a port of a little village – where you spent the previous night (or anchored in a remote bay if you decided to stay there) – with a leisurely breakfast. Over coffee/tea we plan our route and decide which of the many delightful ports will be our destination for later on during the day. Captain Nikos is very well-informed regarding local, historical and cultural points of interest, so you can ask as many questions as you like. Also he knows every part of Ionian waters, every small beach, bay or cave so you can leave yourselves to his hands and relax at all. You can take your time waking up while overlooking the village life and the breathtaking scenery of hills and mountains all around. You can go sightseeing or just do some shopping. The morning continues with a sail to a secluded bay where we will anchor to swim, snorkel, try out our kayak, explore the magic of the underwater world, go to the beach, sunbath on our special made mattresses to soak the warm Greek sun, or sit at the cockpit in the shade of the tent and read your book or serf into the internet by our WIFI access. You also can relax or take the dinghy ashore to explore deserted beaches and islands. 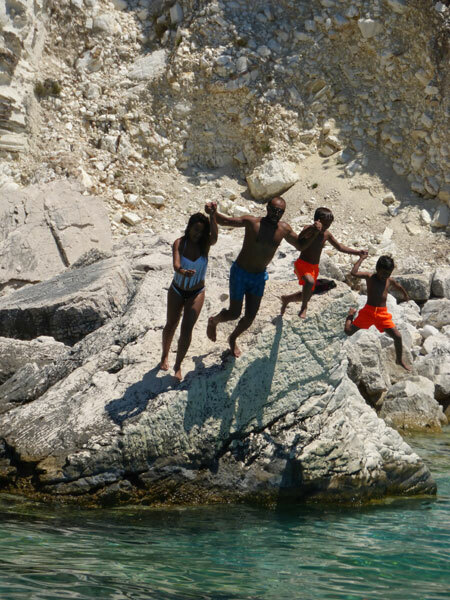 Sailing on board our yachts is a heaven for kids as well, as they normally play for hours in the water, explore the sea life, or run on the beach. Captain Nikos is special to organize various team toys that make them excited. Around 1 o’clock at noon, lunch is served at the cockpit. 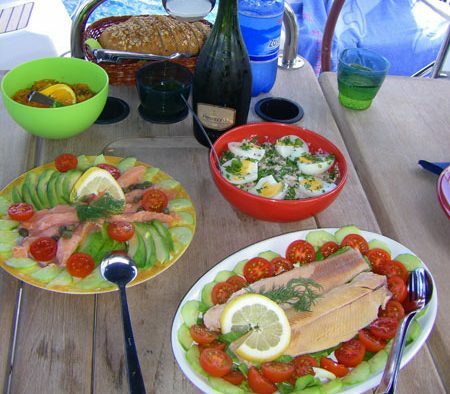 Lesley’s delicious dishes, made with local fresh products, have become one of the attractions of our sailing trips! Later in the afternoon, when the Ionian breezes freshen, you will experience the natural performance of the yacht when the wind alone drives us towards the evening’s port of call. 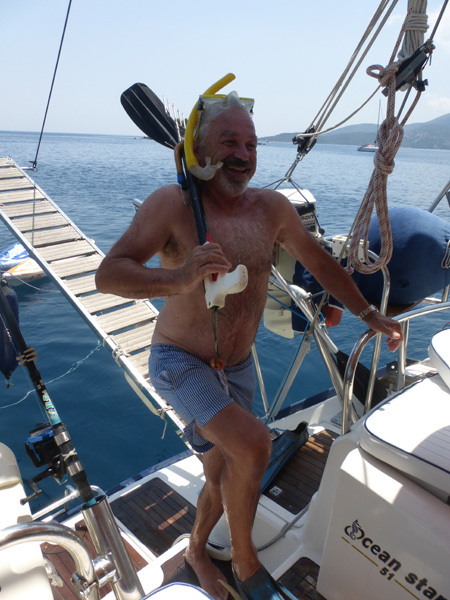 Captain Nikos, depends on the winds, can provide you an unforgettable race sailing. He will expertly moor the yacht, and this will mark the time to relax and take “Sundowners” (cocktails served in the cockpit) as we reflect on highlights of the day’s sailing. Later on, you will step ashore to explore the village port and choose a tavern or restaurant for dinner. A fascinating selection of local taverns is available for you to sample and with our good knowledge of the area, we will suggest some of the places with the best food. As we said earlier, at the beginning of your holiday we only draw a general itinerary, so every day some time during the afternoon, we will discuss the options for the following day.